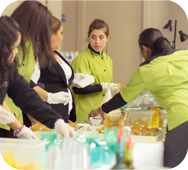 Maya Catering Inc. strictly operates as a catering service therefore does not engage in mass production. We specialize in on-site catering. Our menus are customized to suit any budget and hence freshly created to entice your palate. Every event is carefully planned and executed. Mohit takes great pride and with total dedication and passion operates Maya Catering Inc. Each event is personally coordinated by him. We bring our kitchen to you. We will set up a stage at your desired location; and our dedicated staff will display a spectacular show fondly remembered by your guests. Give us a call to consult on your next event.